How to get more blooming on Adenium? with lovely flowers to make her more beautiful. 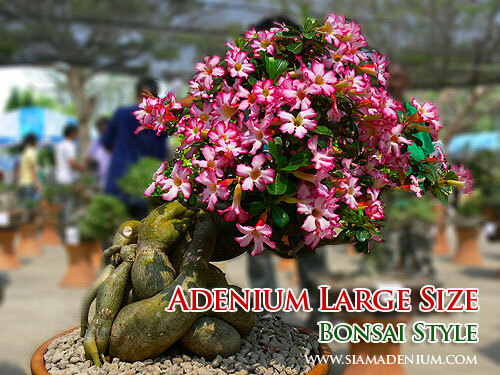 We can make her not only single flower color but also multi-colors or we called; "Fancy Grafting". 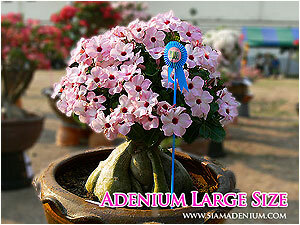 The most popular grafting adenium now is "Rosy Adeniums" grafted with medium or large caudex rootstock. Absolutely, we need to select the nice caudex with your own style. 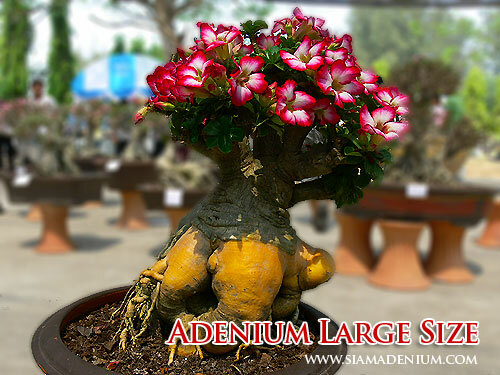 Medium size (3-4 yrs) has about 7-8 inch caudex diameter and Large size (5-8 yrs) has over 12 inch caudex diameter. 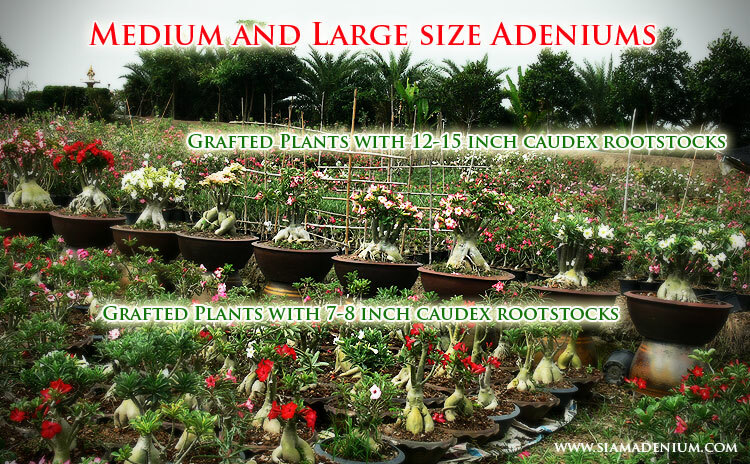 The caudex skin is another point to consider as well, most players or collectors like more antique or wrinkle skin than green one. 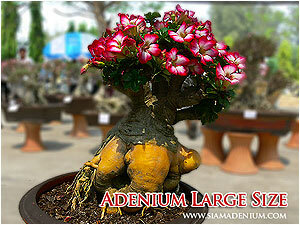 After we finish selecting the rootstock style, next we need to select the adenium flowers or varieties to graft her. To make large size more beautiful and bushy flowers we need to find the variety giving productive flowers. 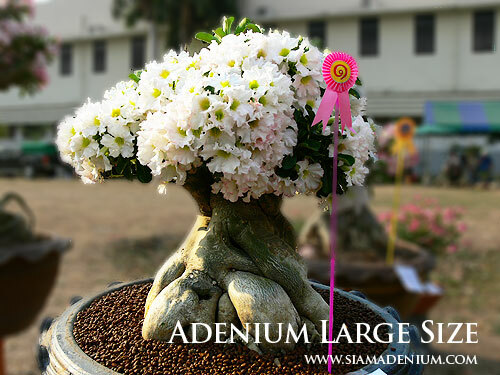 If you don't know which varieties with productive flowers, we can suggest you about this because we have worked and developed many adenium flowers for 7 years. cutting area. 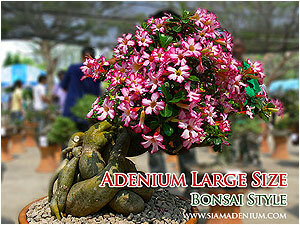 After that time scions will get longer about 2-4 inches then you need to prune them again to get more branches. You can do pruning her again 2-3 times. After you are ok with branch form, now it's time to make flowers. Here is the technique I prepare her in 2 months before joining contest. 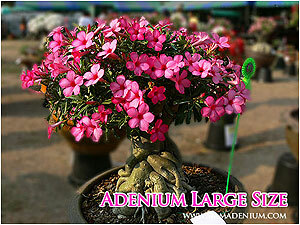 I let Adenium hungry by stop watering for 2-3 weeks. 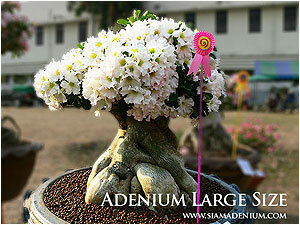 Don't worry, Adenium is very strong and she will be ok especially with big size. After that watering her with 8-24-24 or orchid fertilizer instead of pure water for first 3 days and stop watering until you see small flower buds coming out. After that you can watering her regularly. You should not watering on her flowers, this could be make flower bud broken so you should do this directly on her caudex instead.After 2-3 weeks you will see many flowers coming out with this technique. 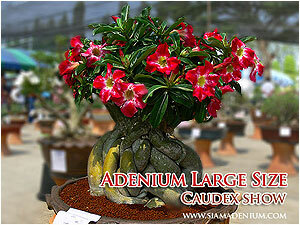 You can see more information about these medium or large adenium size from this link. Take care..